Ever since I started taking spirulina powder, I wake up each morning and enjoy a spirulina smoothie, which usually consists of milk, fruit, spirulina powder, and maybe a little bit of water. The Vitamix 7500 blender is one of two blenders that I currently own, and its awesome. It whips me up a VERY high quality smoothie, juice, or salsa in no time. The Vitamix 7500 has a 60 ounce container, which gives you plenty of room. Sometimes I make enough for two smoothies and keep one for later. It has a lot of power with its 2.2 horsepower motor. You will not have a problem blending tough foods. The reason I like this blender so much is because its everything you need. You can create any sort of blend with it and its 10 speeds. If you want a superfine blended smoothie, no problem. I’ve never come across a food that doesn’t blend smooth with this. It also has a pulse feature, which is great. I’ve only used it a couple of times for my own salsa recipes, and they turned out nice. This feature allows you to blend foods into thicker “chop like” cuts. It it will leave nice sharp and clean cuts, not big chop blended mess. This pulse feature along with its 10 variable speeds allows you to create just about any texture your heart desires. Yes it is. And this is a big deal especially when it comes to blending spirulina powder because it seems to stick to everything. There are times when all I have to do to clean it is add a little soap and water and run it on high for about 30 seconds, and thats after making a spirulina smoothie. If you are just making a regular smoothie (without spirulina) then it should clean up easily like this ever time, like a breeze. Even if there is some spirulina stuck on the sides it is still an easy cleanup. The inside surface is smooth all over without any places that are hard to get. For example I used to have a Nutribullet blender and it was a pain to clean after making spirulina smoothies. It had small grooves on the inside that would take forever to clean out. The Vitamix 7500 is smooth and easy. The price is pretty high but it will last forever and it can potentially save you money. If you are buying juices or smoothies or even liquid spirulina drinks you are probably spending anywhere from $2 to $8 a drink. So lets say you are spending $5 on a juice/smoothie everyday. I’ve had my blender for about a year and 1 month now, so about 396 days. If I were paying $5 per day on blended juices/smoothies I would have spent $1980! It adds up. 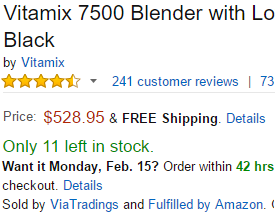 Compare that to the price of the Vitamix 7500 at $528.95. I’ve saved a lot of money now that I think about it. The only drawback I can think of about this product is the price. Its expensive but I think its worth the price. You will love your new juices or smoothies that you make with the Vitamix 7500 because it blends/chops to perfection. Drinking a blend of raw foods every morning wakes you up and gets you ready for a great day. If you want the best of the blender world I recommend a Vitamix such as this one. It will last you a VERY long time, and if it doesn’t there is always the 7 year warranty for you replace it. I hope you have found this review helpful. If you already have this product leave your own review below. PrevEarthrise Spirulina Review – How good are their spirulina tablets? NextSpirulina and the Thyroid – Is it Beneficial? You give an excellent review on the vitamix 7500, outlining the benefits especially for all of us health junkies out there who enjoy making our own special drinks. I myself do not have one of these vitamix beauties as of yet. The price is a little steep for me but I continue to save my change and will be looking into purchasing hopefully in the near future. Thanks for your info! Ya the price is quite steep indeed. Its not something most people just go out an buy. But I love mine, just saying. I really really want this blender now! Lol. I use my blender a lot for smoothies and salsas (I bought one for $10 around at Walmart I believe), and it does a good job, but there’s always those little annoyances I have sometimes while making something. 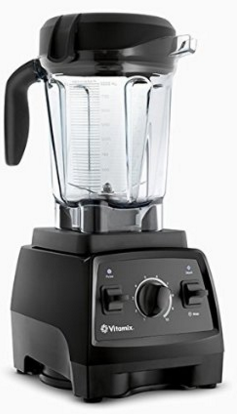 It sounds like this blender actually covers all of the areas I need fixed in my daily routine. Thanks for the info! You can’t go wrong with a $10 blender. But really, the Vitamix 7500 is the greatest. Hello, I have a similar review on my website about Blenders, I love Vitamix, I own one, Not this one though, They are extremely powerful, I love the way you have explained all the benefits, I will share this post to my friends and family as I know they will find this review helpful, Look forward to more content! Thank you sir. Vitamixs are the best. What kind do you have? Excellent site. One of the better I’ve seen. Your products are high value and your site offers value in describing them. I like how well the site is laid out too. It is easy to navigate. This was the first I had actually seen the Spirulina products. I can see the benefit. As someone who typically doesn’t use a blender, the high price scares me. I would just buy a 40 dollar blender. But there are people who will..
What a great review. You’ve written this exactly as I would want to hear a review – easy to understand and not a whole lot of techno jargon! I’m glad you’ve talked about the cleaning aspects – a lot of blenders are hard to clean with all their grooves, and that’s only with an ordinary berry smoothie. I do think it’s quite expensive, but you’ve convinced me of it’s worth by breaking down the daily spend on buying smoothies as a comparison. Sounds like a good investment to me! Thank you Mara. Ya its definitely quite expensive. The cleaning aspect is a big deal to me as well and this blender ranks at the top of my book as far as that goes. Wow, I learned so much about Spirulina! I haven’t tried it before, but I’ve heard about its many benefits. You really cover it all here! I’m a science-minded person myself so I appreciate all the nitty-gritty nutritional details. Very helpful information. Keep up the good work and research. 🙂 I don’t know if I’m ready to buy spirulina, but when I am I will remember your site. Thanks for the complements. I’m glad you enjoyed my site.